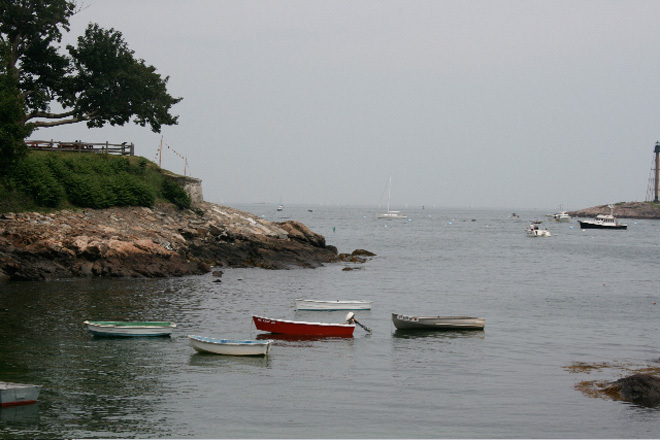 I recently traveled to Marblehead, Massachusetts and being incredibly hungry when we arrived, my friends and I went directly to the ocean’s edge where we discovered The Barnacle. This place brought me directly to my waitressing days. The smell of fried food and lobster mixing with the salty ocean air made this the quintessential seafood restaurant. The outdoor seating was full of families munching on huge plates of fried clams, tourists cracking steamed lobsters, and friends having a late lunch. The view was impressive. Majestic sailboats meandering past, a working lobster boat chugging to port, and a clear view of a lighthouse directly across the channel. Reluctantly, we sat inside where I quickly became fascinated by the little bits of local color decorating the walls. Old menus, oars, a collection of t-shirts gave the place a salty vibe. We settled into our seats and were promptly greeted by our server. Our order was simple: iced teas, lobster rolls, and cups of clam chowder. 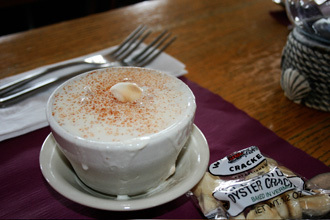 Let me first say, that I am not only a seasoned restaurant employee, I am a girl who grew up on the coast of Maine. It takes a lot to impress me, but I admit, The Barnacle delivered. The unsweetened ice tea was cold with plenty of ice and lemon. This was a deal at two dollars a glass. The chowder was thick and creamy with plenty of fresh clams, chunks of potatoes, and onion. The clams were flavorful and the broth was salty and good. A cup sells for $4.95. The crowning jewel of our meal was the lobster rolls. Chilled lobster meat sat on a bed of crisp lettuce. 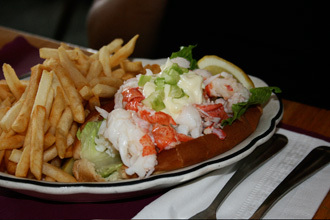 The mayonnaise was placed on top, so you could mix at will, something I always appreciate in a good lobster roll. The added chopped celery gave it that perfect extra crunch. Piping hot french fries were served on the side. Did I mention the lobster? It was sweet and fresh. The Barnacle’s lobster rolls sells for $19.95. The Barnacle is open year-round, but times are subject to change in the off-season.